Synthetic peptide, corresponding to residues in Human SH3KBP1 (Uniprot ID Q96B97). Human spleen, fetal thymus, fetal brain and Jurkat lysates. Our Abpromise guarantee covers the use of ab154858 in the following tested applications. WB 1/1000 - 1/10000. Predicted molecular weight: 73 kDa. Adapter protein involved in regulating diverse signal transduction pathways. 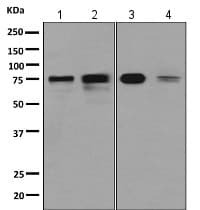 Involved in the regulation of endocytosis and lysosomal degradation of ligand-induced receptor tyrosine kinases, including EGFR and MET/hepatocyte growth factor receptor, through a association with CBL and endophilins. The association with CBL, and thus the receptor internalization, may inhibited by an interaction with PDCD6IP and/or SPRY2. Involved in regulation of ligand-dependent endocytosis of the IgE receptor. Attenuates phosphatidylinositol 3-kinase activity by interaction with its regulatory subunit (By similarity). May be involved in regulation of cell adhesion; promotes the interaction between TTK2B and PDCD6IP. May be involved in the regulation of cellular stress response via the MAPK pathways through its interaction with MAP3K4. Is involved in modulation of tumor necrosis factor mediated apoptosis. Ubiquitously expressed. Also expressed in some cancer cell lines. The SH3 domains mediate interaction with SHKBP1. Monoubiquitinated by CBL and CBLB after EGF stimulation; probably on its C-terminus. Cytoplasm > cytoskeleton. Cytoplasmic vesicle membrane. Cell junction > synapse > synaptosome. Cell junction > focal adhesion. Localized in endocytic vesicles containing clustered receptors. Colocalizes with ASAP1 in vesicular structures. Colocalized with actin microfilaments and focal adhesions (By similarity). Colocalized with MAGI2 in synaptosomes. ab154858 has not yet been referenced specifically in any publications. Publishing research using ab154858? Please let us know so that we can cite the reference in this datasheet. There are currently no Customer reviews or Questions for ab154858.